BCAction member Donna Kaufman representing women living with breast cancer who couldn’t be at the rally. By Caitlin Carmody, Membership Coordinator and Annie Sartor, Policy and Campaigns Coordinator, reporting from Washington, D.C.
“A patent is a reward for invention not a reward for effort. Myriad didn’t invent anything.” (ACLU senior counsel Chris Hansen, today at the US Supreme Court). 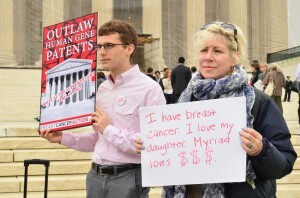 Today the Supreme Court heard oral arguments in our landmark challenge to Myriad Genetics’ patents on the human “breast cancer” genes, BRCA1 and BRCA2. 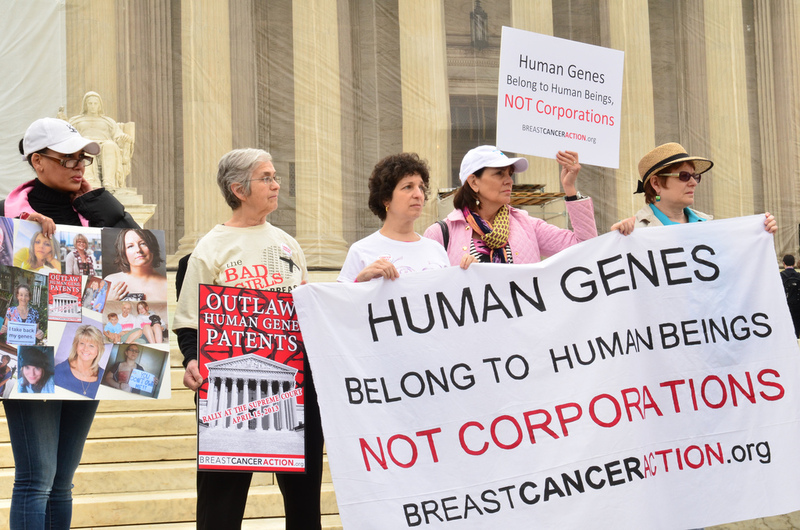 While our lawyers were inside making our case against corporate ownership of our bodies, we stood at the steps of the US Supreme Court along with activists from across the country, and rallied our hearts out on behalf of women’s health and against corporate control of our genes. 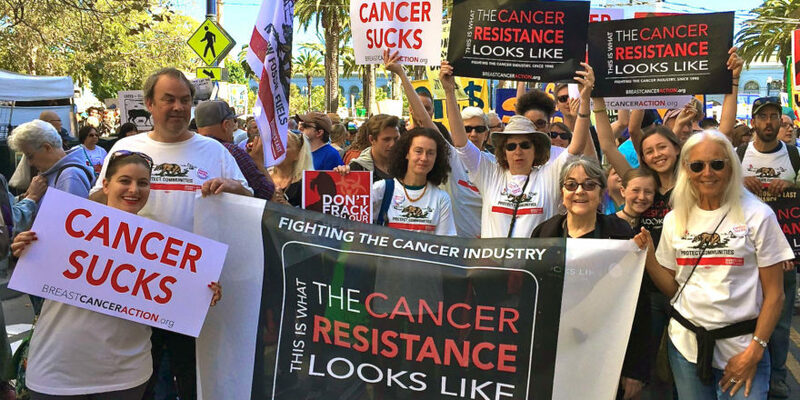 BCAction Executive Director Karuna Jaggar was one of only 15 members of the public who managed to get a seat inside the courtroom. Inside as out, the importance of this case was apparent. Seated around Karuna was a veritable “who’s who” of the biotech industry. Undoubtedly, the Myriad case has the power to significantly change much in the field of science and medicine. It’s impossible to overstate the importance of this case. Karuna reported that inside the courtroom the energy was high, and our ACLU lawyers, led by senior counsel Chris Hansen, were on fire, relentlessly pushing this case with ever-increasing clarity closer and closer to a victory for women’s health: “Given the energy in the courtroom and the responses of the Justices, I am contemplating exactly what a favorable ruling will mean for women,” said Karuna. We were proud of our friends inside the courtroom on this historic day. But we were awed and humbled by all the passionate women’s health advocates gathered outside. What an incredible sight! Breast Cancer Action has always insisted that change happens because we demand it and today, we witnessed change in the making. 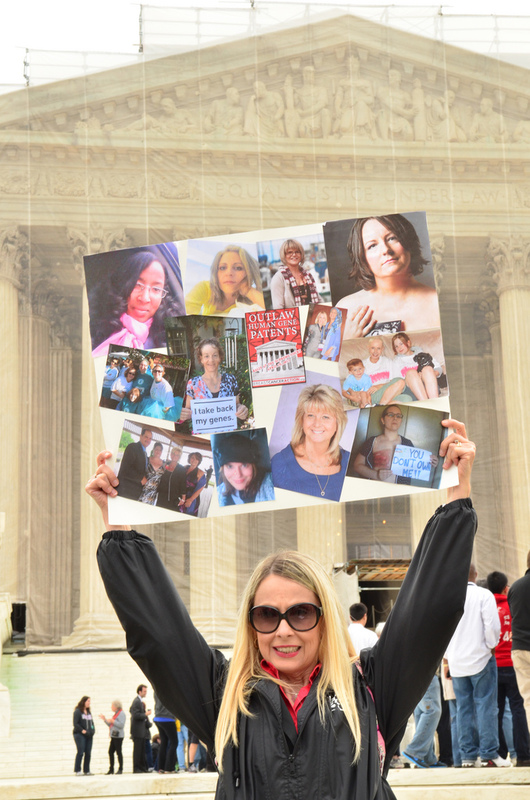 At the steps of the U.S. Supreme Court, on this rainy, Monday workday morning, about 50 people from 14 states across the country joined together to stand against human gene patenting. Meeting for the first time this morning, women who have helped build BCAction for decades, women who have undergone prophylactic surgery to remove their breasts and ovaries, women with metastatic breast cancer, women in the midst of treatment, recent college graduates, new members visiting DC with their daughters, all of them joined together and chanted, spoke out, and bore witness to this critical issue in women’s health. Their stories and passionate accounts of why we continue to demand the changes we do reiterated a simple common belief: we do this work, we are here today because women’s lives are at stake. 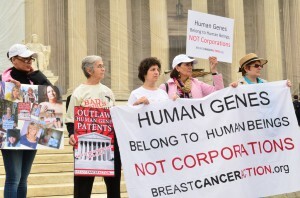 Our combined words challenged the practice of ‘business of usual’, as we reminded all who listened that Myriad’s patents on the human BRCA genes impact all of us: these patents damage our health, limit access to an outdated and overpriced test, and prevent much-needed second opinions. 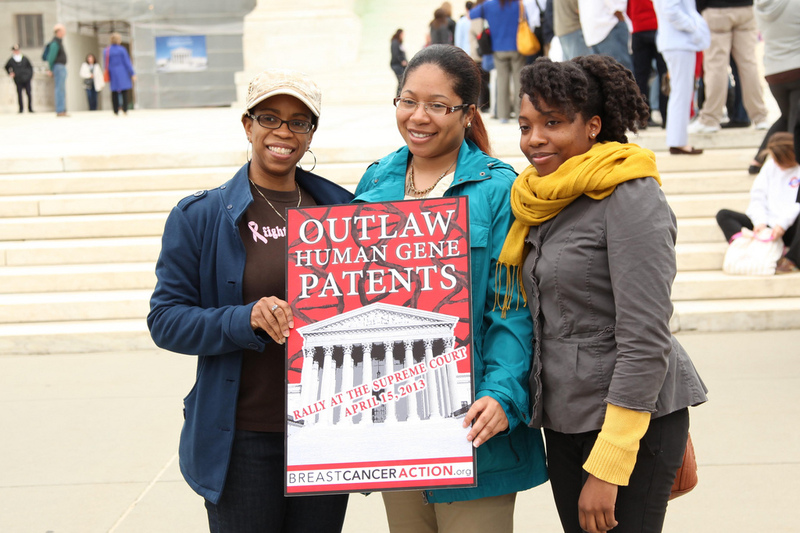 Everyone we talked to at the rally shared compelling stories about why they believe human gene patenting is wrong and why the U.S. Supreme Court has to correct this wrong. One of our chants was, “5 – 4, 4- 5: These Decisions Control Our Lives!” and it couldn’t be more true. 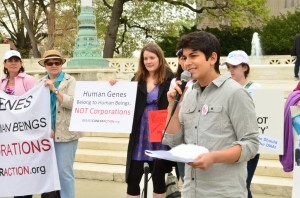 Several women took the microphone and spoke powerfully to the rally crowd to talk about how Myriad’s monopoly on our genes had directly impacted them. These women’s moving stories are a strong testament to the future direction of women’s healthcare if we continue to put corporate profits before women’s health, and allow corporate control over our very DNA. Speakers talked about themselves, their mothers, aunts, and daughters. People proudly held up signs and pictures of loved ones. We were inspired throughout the event by representatives from partner organizations who supported us in our stand against Myriad’s gene patent. 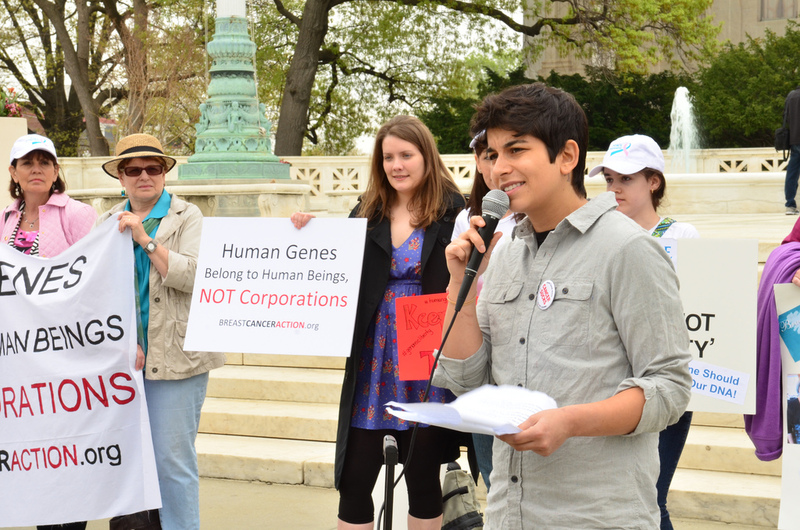 Representatives from FORCE, METAVivor, Friends of the Earth and Knowledge Ecology International joined us and took turns on the mic to talk about the real health harms that result from Myriad’s gene patent. It was a thrill to meet so many wonderful people working hard for women’s health, and it was incredibly moving to hear from the powerful women who stood up to tell their personal stories. 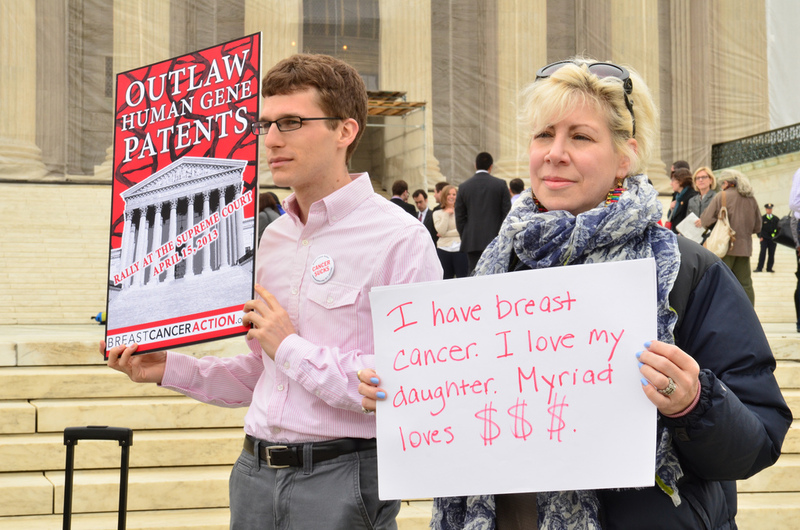 We know that Myriad’s patents on our genes are wrong, and we hope that the Supreme Court will take this opportunity to come down on the right side of women’s health. We’ll have more updates over the coming days—beginning with tonight’s reception in DC. So stay tuned to Breast Cancer Action in the months to come because we won’t stop until we see the necessary changes to finally address and end this breast cancer epidemic. To see more pictures of the rally, check out the album on our Facebook page.